Allura’s life is a testament to the strength and resilience of educated Middle-Eastern women in the modern age, who are railing against a life that makes little sense, with all its twists and turns. A tower of courage and energy, her enthusiasm to challenge life’s obstacles and temptations reflects some of the mind-blowing hardships various women face. Bound by passion, linked by need, Allura offers readers a better understanding of life in a cross-cultural environment, where women are wrongly perceived by the outside world as spoilt, reclusive, and vulnerable. Social constraints, family upheavals, and unexpected tragedies force Allura to stand on her two feet at a young age and make life-changing decisions, which is when her whole world begins to unravel. 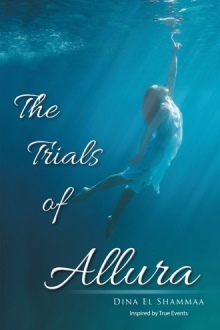 Join Allura on her extraordinary journey of highs and lows, humorous encounters, and fateful experiences, which transform her from a shy and sheltered teenager to a courageous, resolute, fiery, and tempestuous woman. An author inspired by innocence, simplicity and beauty, Dina El Shammaa’s extensive writing background helps her uncover unexpected daily occurrences that affect the lives of millions of women in the region and beyond.